This article is about the room. For the play, see The Dining Room. For the band, see The Dining Rooms. It is true that the owners of such properties began to develop a taste for more intimate gatherings in smaller 'parlers' or 'privee parlers' off the main hall but this is thought to be due as much to political and social changes as to the greater comfort afforded by such rooms. Over time, the nobility took more of their meals in the parlour, and the parlour became, functionally, a dining room (or was split into two separate rooms). It also migrated farther from the Great Hall, often accessed via grand ceremonial staircases from the dais in the Great Hall. Eventually dining in the Great Hall became something that was done primarily on special occasions. 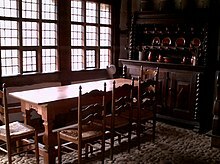 A typical North American dining room will contain a table with chairs arranged along the sides and ends of the table, as well as other pieces of furniture such as sideboards and china cabinets, as space permits. Often tables in modern dining rooms will have a removable leaf to allow for the larger number of people present on those special occasions without taking up extra space when not in use. Although the "typical" family dining experience is at a wooden table or some sort of kitchen area, some choose to make their dining rooms more comfortable by using couches or comfortable chairs. In modern American and Canadian homes, the dining room is typically adjacent to the living room, being increasingly used only for formal dining with guests or on special occasions. For informal daily meals, most medium size houses and larger will have a space adjacent to the kitchen where table and chairs can be placed, larger spaces are often known as a dinette while a smaller one is called a breakfast nook. Smaller houses and condos may have a breakfast bar instead, often of a different height than the regular kitchen counter (either raised for stools or lowered for chairs). If a home lacks a dinette, breakfast nook, or breakfast bar, then the kitchen or family room will be used for day-to-day eating. This[clarification needed] was traditionally the case in Britain, where the dining room would for many families be used only on Sundays, other meals being eaten in the kitchen. 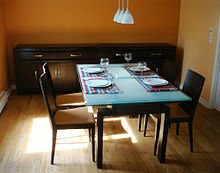 In Australia, the use of a dining room is still prevalent, yet not an essential part of modern home design. For most, it is considered a space to be used during formal occasions or celebrations. Smaller homes, akin to the USA and Canada, use a breakfast bar or table placed within the confines of a kitchen or living space for meals. ^ "dinette - definition of dinette by the Free Online Dictionary, Thesaurus and Encyclopedia". Thefreedictionary.com. Retrieved 2013-02-15.